While Georgia is still sweating from a looming heat wave, many kids are heading back to school. And in the wake of recent student athlete deaths, the Red Cross recommends that parents and coaches take steps to ensure the safety of their kids. Of course these tips don’t have to be exclusive to school kids. I am on my third attempt to get in better shape this year. I’ve adopted running as my newest hobby and will run a 5k in just a little over a month! Training in all this heat has not been pleasant and these measures will definitely come in handy. Allow athletes to get acclimated to the heat by reducing the intensity of practice until they are accustomed to it. Make frequent, longer breaks a regular part of practice. About every 20 minutes stop for fluids and try to keep the athletes in the shade if possible. Reduce the amount of heavy equipment –like football pads– athletes wear in extremely hot, humid weather. Dress athletes, when appropriate, in net-type jerseys or light weight, light colored, cotton t-shirts or shorts. Get the person to a cooler place and have him or her rest in comfortable position. 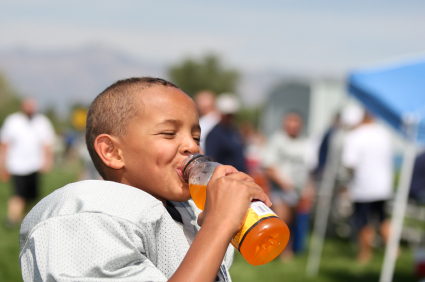 Give a half glass of cool water or a sports drink with electrolytes every 15 minutes. Do not give liquids with alcohol or caffeine in them, as they can often make conditions worse. Move the person to a cooler place. Remove or loosen tight clothing. Spray him or her with water to apply cool, wet cloths or towels to the skin. Fan the person. If the person is conscious, give small amounts of cool water or a sports drink with electrolytes to drink. Make sure the person drinks slowly. Watch for changes in his or her condition. Signs of heat stroke include those of heat exhaustion and hot, red skin which may be dry or moist; change or loss of consciousness; seizures; vomiting; and high body temperature. Move the person to a cooler place. Quickly cool the person’s body by immersing them up to their neck in cold water if possible. If unable to immerse them, continue rapid cooling by applying bags of ice or cold packs wrapped in a cloth to the wrists, ankles, groin, neck and armpits, spraying with water and/or fanning. You can also learn how to prevent and respond to heat-related and other emergencies by taking a First Aid/CPR/AED course. Call us at (404) 876-3302 or visit redcross.org/training to register.